Dust off your binoculars because Mexico is planning to celebrate the stars during 2010. According to the National Institute of Anthropology and History (INAH), astronomy-related activities will be held at archaeological sites as well as in public plazas and parks throughout Mexico. These events will honor Mexico’s important role in creating the Carta del Cielo (Sky Chart) during the late 19th century. The Paris Observatory invited the Mexican government to take part in this ambitious scientific project, which involved creating an atlas of stars that are not bright enough to be seen with the naked eye. Mexico subsequently contributed over 1200 celestial photographs taken with a new telescope bought in 1889 from a company in Dublin, Ireland. The original Carta del Cielo telescope is still in excellent condition and continues to be used at the Tonantzintla Observatory in the state of Puebla. 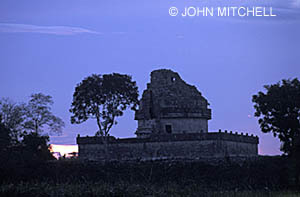 El Caracol, a Maya astronomical observatory at Chichen Itza. Click on photo for more information.